Data from Buoy - Understanding and Acting Within Loweswater: A community Approach to Catchment Management, Lancaster University, UK. Loweswater 2009 weekly average wind speeds. 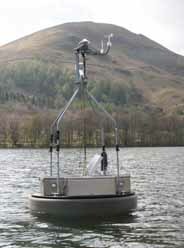 The data of the buoy provided detailed information on the condition of the lake and its short-term responses to weather events. This increased our understanding of how the lake functions. It was also used to validate a lake model that was run to test the effect of different management actions, such as reducing phosphorus load, on water quality.